Rota-Beam RB6 | Alpine Products, Inc.
Rota-Beam RB6 is a versatile, mid-sized beacon, perfect for utility, maintenance, fire and rescue applications. Its straight forward relampable design is easy to install and easy to service. 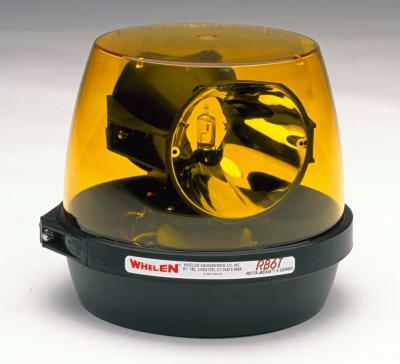 In 1956 Whelen introduced the popular Rota-Beam Rotating Beacon. RB6 continues this tradition with superior performance and reliability. This mid-size beacon is great for many utility, maintenance, fire and rescue applications. – New dual reflector model, 65 RPM produces 130 FPM for a longer “on time” light. – Single prarbolic reflector beacon, 150 RPM produces 150 FPM. – Tall and wide profile. – Unique motor assembly with precision double roller ball bearings provides superior performance with less friction, minimal noise and ultimate reliability. – New parabolic reflectors, designed by computer sterolithography, have dramatically increased ligth intensities with greater optic spread. – 3 year warranty on motor assembly. – Meet and exceeds S.A.E and california Title XII and NFPA 1901 requirements for emergency vehicles. – Polycarbonate domes are sealed to base with weather resistant “O” ring gasket. – Non- corroding bases offers both 1″ NPT pipe mount and concealed permanent flat mount in same unit. No additional flanges or mounting collars are required. – Optional magnetic mount kit with cord and cigar plug. – Straight forward relampable design is easy to install and easy to service. – 50 watt halogen lamp delivers greater intensity of comparable beacons. – Meet and exceeds S.A.E and California Title XIII and NFPA 1901 requirements for emergency vehicles. – Available in all five safety colors.